A new kind of moveable feast comes to the San Juan Islands. Crudités with truffle salt...sweet corn soup with shrimp and jalapeño cornbread...bacon and kale farro with scrambled eggs...white chocolate raspberry cheesecake....It’s hardly what you’d expect to be served while on a sea kayaking trip. But I wasn’t on just any kayaking trip; I was tagging along on the inaugural voyage of a “gourmet” guided kayak trip codesigned by Seattle food tour company Savor Seattle and San Juan Outfitters, one of the premier kayak guiding services in the Pacific Northwest. 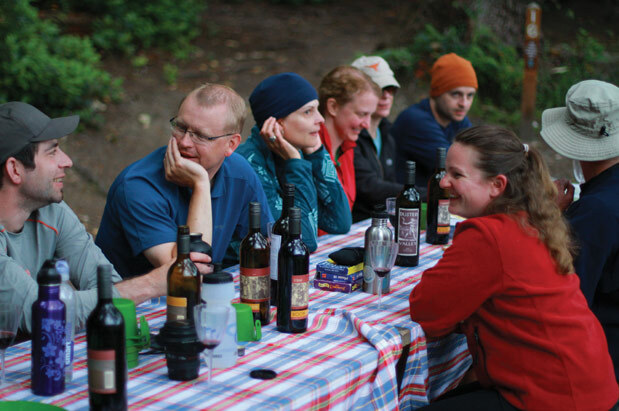 The goal of the trip was to combine the pleasures of an invigorating adventure to the wild outer edges of the San Juan Islands with expertly prepared food sourced from leading regional purveyors. While several outfitters lead guided kayaking trips through the San Juans—replete with MacGyver-caliber guides showing the way and preparing gussied-up camp food in makeshift picnic-table kitchens—this tour was going to be different: The food would be sharing center stage with the scenery. If camping’s not in your repertoire, try one of these outfitters that offer kayaking day trips, from whale watching to women-only, as well as multinight adventures. Discovery Sea Kayaks offers whale-watching and multiday tours, including one that involves a “mothership” catamaran, which hauls paddlers and their kayaks around to the best areas for kayaking. Check out the nighttime “bioluminescence” tour to see living organisms that emit green light at night. Besides the gourmet tour, San Juan Outfitters offers multiple other tours, such as whale-watching and a multisport tour that includes bicycling and hiking. Try San Juan Kayak Expeditions, for women-only and other expeditions. Savor Seattle cofounder Angela Shen created the menus for all of the meals and snacks on this adventure from locally sourced ingredients: spices from Pike Place Market’s MarketSpice, wine from Walla Walla’s Dusted Valley Vintners, chocolates from Fran’s, cherries from Chukar. She then trained guides—in our case, Aileen Murphy and Katy Clarke—in how to prepare the menus; they would carry out both cooking and guiding duties. As we huddled around Murphy on the dock at Friday Harbor to chart our route for the three-day, two-night trip, my stomach was already grumbling; I had skipped breakfast that morning. But word had leaked that just a half-hour paddle from our launching point, we would be making landfall on a deserted San Juan Channel beach to dig into our first meal, an al fresco lunch of Vietnamese salad with shrimp and lemongrass meatballs. After a last-minute tutorial on how to get into the tandem kayaks from a dock, the participants—a mix of sea kayaking novices and old hands—tightened our life jackets and spray skirts, and climbed aboard the only transportation we would need for the next three days. And off we paddled. For me, nothing beats the weightless feeling of those first few strokes after a long time away from the water, with arms and core muscles working themselves into a groove as the rhythm of paddling becomes second nature. But what really gave me goose bumps that particular morning was the horn blast of the ferry as it pulled away from the dock ahead of us—a fitting goodbye toot from civilization—followed by a bald eagle carving lazy arcs into the blue sky. 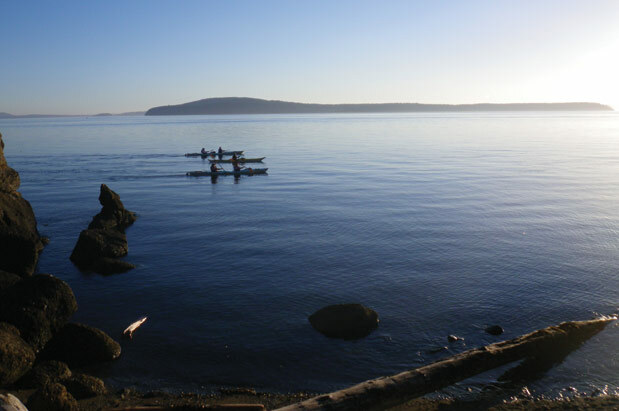 Indeed, it didn’t take long for the first-time paddlers in our group to discover what’s so great about sea kayaking in the San Juans. After just a half-hour “warm-up” in the kayaks, we landed at the much-anticipated deserted beach, and out came the boxed salads that seemed to spring right out of the earth, the sea and a top-notch International District kitchen. No sooner had we finished eating than the guides scooped up our empty boxes, stacked and packed them away, and launched us back out into teeming San Juan Channel for our first big crossing. Settled back into our boats, we “rafted up” together, gripping each other’s cockpits and paddles, as the wake from another passing ferry dissipated through the water column. Murphy pointed due north to our next destination, Yellow Island, an 11-acre gem owned by The Nature Conservancy since 1979, where we would be stopping to check out one of the best wildflower displays in the San Juans. Getting there would involve a four-mile paddle—including a channel crossing. Our guides reminded us that our tandem (two-person) kayaks were stable and that the guides would always be nearby. With that we separated, synced our strokes and headed north. Along the way, we encountered sailboats, seagulls, skiffs and a fleeting glimpse of a harbor porpoise’s backside. Within an hour, we were negotiating the rocky headlands of Yellow Island while a young harbor seal snooped around our boats below the surface. We beached the kayaks and made our way past a little boathouse and up the path, where we met Phil Green, the caretaker of Yellow Island for the past 14 years. We sneaked a peek at the driftwood house he inhabits, then headed out to hike the loop trail around the small island. We were dazzled by the profusion of reds, purples and yellows carpeting the landscape under the twisting, red-barked boughs of madrona trees. Our journey next took us farther north to Jones Island, the 188-acre state park where we would soon pitch our tents. With no resident human population and some two dozen different campsites, Jones is a dream come true for kayakers looking to get away from it all and soak up the natural essence of the San Juans. It’s a wild place indeed; a loop trail takes hikers through a diverse array of terrains in less than two miles. As we explored the island, our guides got busy setting up their camp kitchen—essentially two propane-powered double-burner Coleman camp stoves—and prepping for dinner. I didn’t mind waiting; I was perched on a cliff staring out at San Juan Channel as the surf crashed below and the sun sank toward the western horizon. With my cell phone finally out of juice and the rest of the United States at my back, there was nowhere else I would have rather been. If it weren’t for the wild king salmon spiced with dill and smoked sea salt, and the balsamic zabaglione olive oil cake waiting for me back at the campsite, I might still be sitting there to this day. But I made my way back to camp and took a spot at the picnic table, where happy-hour appetizers were being served. As I raised my Lucite wine glass of Boomtown Pinot Gris to my lips, I thought to myself: This is the way camping should be.